Daily Picks 7-26-09 | Tanuke has moved! This was uploaded by ArrowQuivershaft. It was drawn for him by an artist at the anthrocon convention 2009. No site was listed. The wings and tail are very well done on this bird. They curve and flex like feathers should. How wonderful! The thighs look quite fluffy. that’s how they would look on a feral hawk. Glad to see that here on an anthro! This is an all-around awesome anthro bird design. 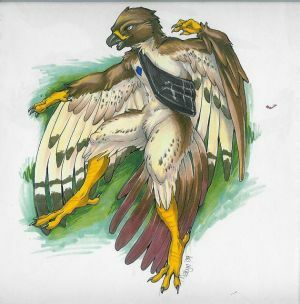 I’d so love to be this hawk here :> the best bird anthro I’ve ever seen!